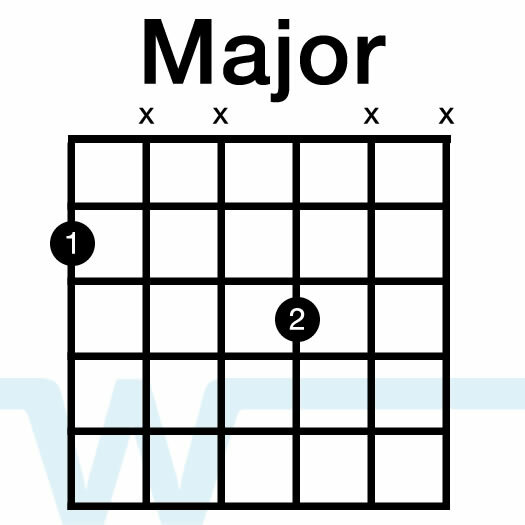 If you play these chords using the following diagrams, the progression will sound fine, but you might think it’s a bit boring or a bit ‘vanilla’. 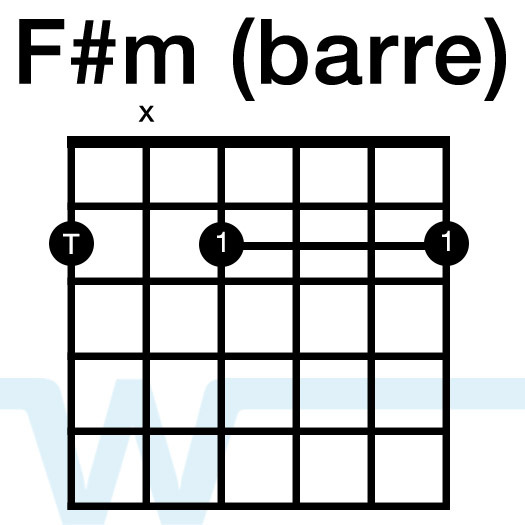 These are probably the way you first learned how to play these chords. 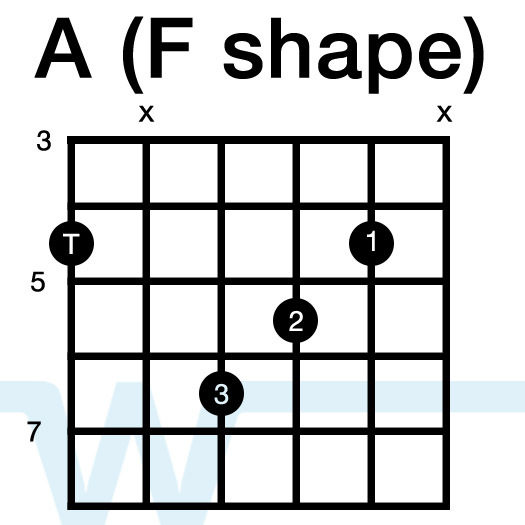 Here is the way Bradford played these chords, using a combination of different chord voicing and moveable shapes. 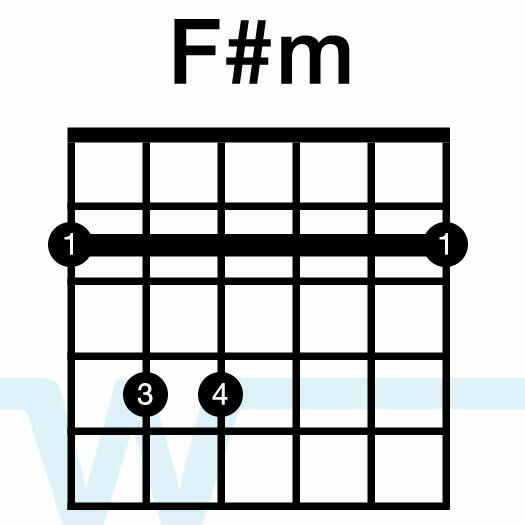 All the minor chords (F#m, G#m, and C#m) use the same exact finger positions, just moved around the neck. With this moveable shape, the low E string determines the chord you’re playing. 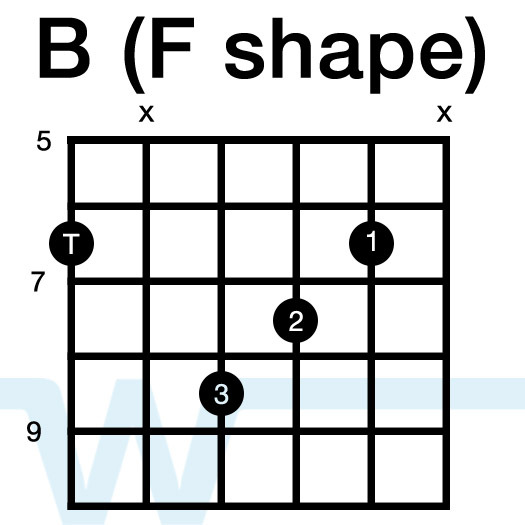 The B and A chords use the same moveable shape. 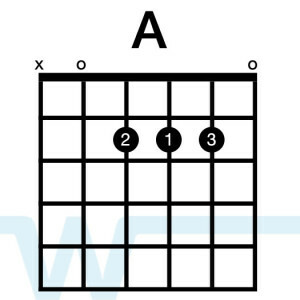 Again, the low E string determines what chord you’re playing. 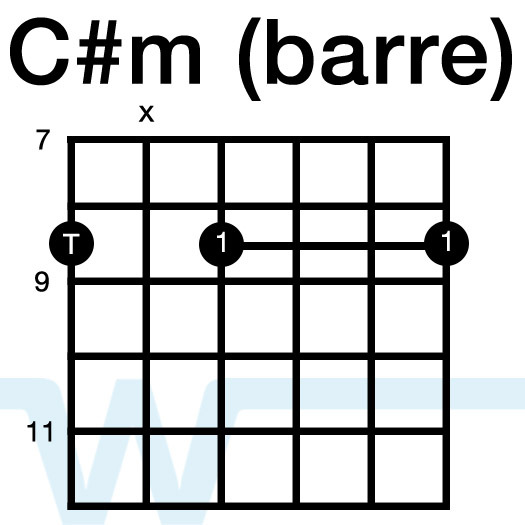 When playing the C#m shape, you are in position to play the C#m Pentatonic scale. 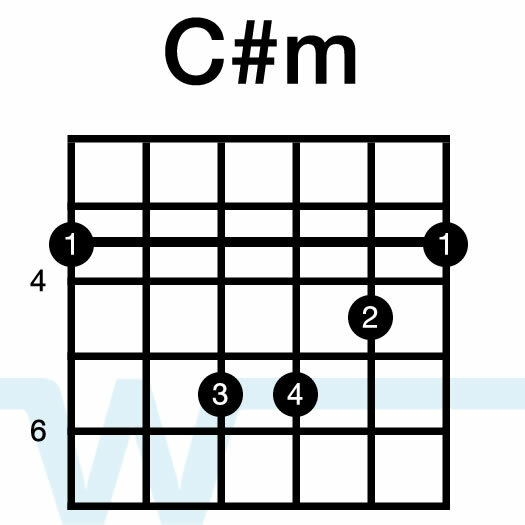 Since C#m is the relative minor in the key of E, anything you play inside this scale will work in this key. 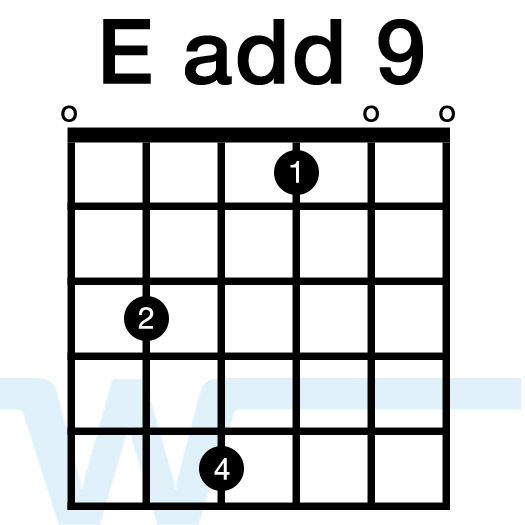 You can suspect the B (the V chord) by fretting the G string on the 9th fret. Octaves are a great tool, and a very easy introduction to more lead type guitar. 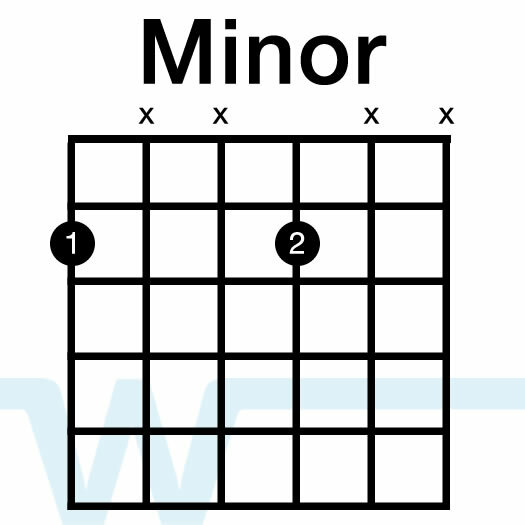 Our Octaves lesson will teach you how to play them quickly and easily. In this video guitar lesson we learn how how to play some really cool sounding lead/rhythm type stuff using one single note. In this lead guitar lesson, we show you how you can easily identify melodic lead guitar parts using common chord shapes. One of the best ways to improve your guitar playing is to learn to play more dynamically. In this guitar lesson you’ll learn two simple tips for strumming that will teach you how to play with more dynamics. In this lesson, Bradford shows us how to use any looper type of pedal (or a pedal with a looper built into it) to create an ambient loop that you can play other parts on top of. Bradford Mitchell shows us how to use two different delays (stacked) and some very easy lead lines to create some nice ambient lead parts. This type of thing works very well in spiritual direction types of moments (during prayer or intimate speaking parts), or in transitional moments. For the major shape, you can hammer on one fret above your 2nd finger (on the G string). This hammer on will work for all the chords but the 4 chord. 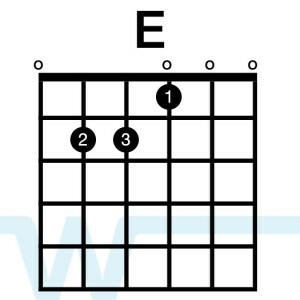 To know which chord you’re playing, just look at the note of the E string. 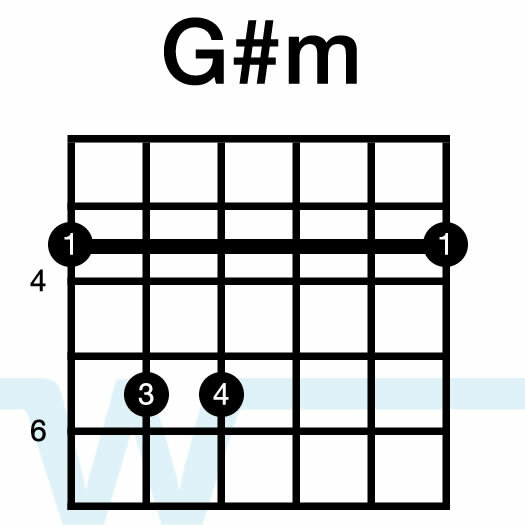 For example, when your first finger is on the 3rd fret, you’re playing a G. On the 5th fret – you’re playing an A, and so on. To create the delay sounds Bradford used in the video, you’ll need two delay pedals, or one pedal that will do two separate delays at the same time. Set one to dotted 8th delay and the other to quarter note. Set your level and feedback controls to your liking, and then listen to the magic happen. Add reverb for more ambience. In this lesson, Bradford teaches you an easy way to play cool lead parts using the A major scale and dotted 8th note delay. This trick can be applied in any key (using the major scale) to most modern worship songs – especially the upbeat more synth driven songs. Set your delay to dotted 8th subdivisions. You’ll want to pick in 8th notes – let the delay do the rest. 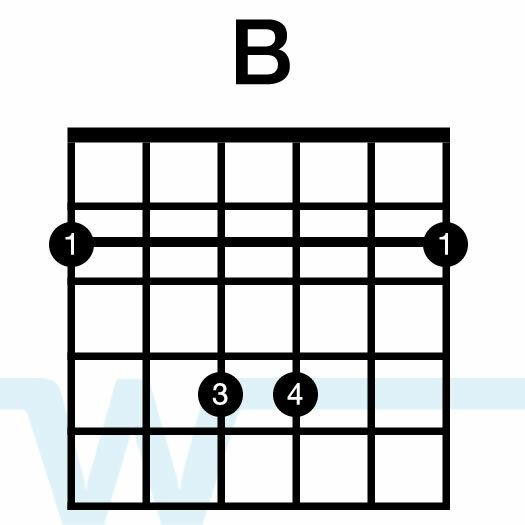 Alternate between the high E and B strings. You’ll keep your finger on the 5th fret of the B string, but alternate between the 5th, 7th, and 4th frets of the high E string. My brother has just sent this article to me. He knows that my son is interested in playing the guitar. When we visited him, he advised my son to enroll in a guitar lesson to which I even agreed. I am always a supportive Mom for them! I would just like to thank you for doing an incredible job! You have no Idea how much your ministry ‘worship tutorials’ means to me! I am an South African living in the US and have been leading worship for 30 years. Your ministry is very encouraging and helpful.